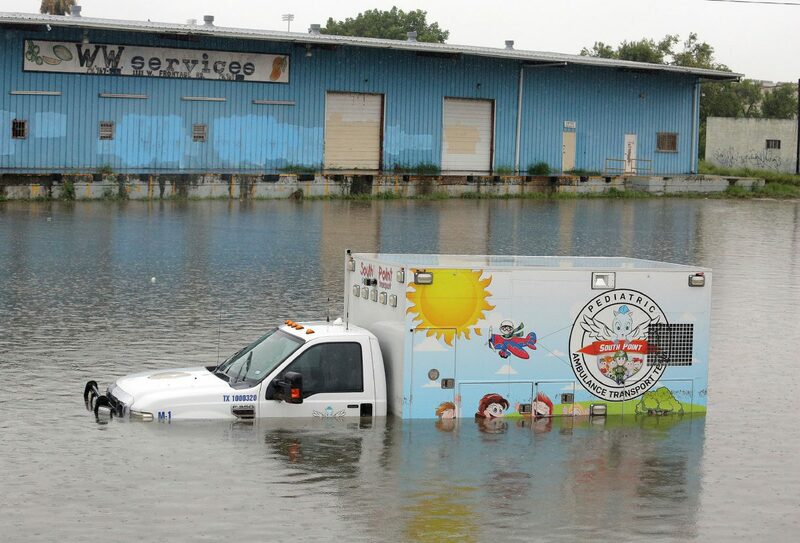 An ambulance sit stalled along the frontage road next to Expressway 83 as heavy rains caused water to rise and flood whole neighborhoods on Wednesday, June 20, 2018, in Weslaco. Less than 24 hours after the Mid-Valley was hit with relentless rainfall over a four-hour period Wednesday, much of Weslaco and Mercedes remained flooded Thursday, dozens of abandoned cars from the day before parked in the same spots along the expressway now waist-deep in dirty water. Residents spent the day sifting through damaged property, many in a daze, processing the destruction surrounding them. Despite the looks of it, local officials say the devastation is not a result of improper planning but rather the blunt force of Mother Nature, what one official simply called an “excessive” amount of water. The drainage systems in place worked as designed, officials said, assuaging residents’ concerns. As rain fell again Thursday in the area bombarded by at least a foot of water the day before, floodwaters continuously descended into the drainage system built to protect the low-lying area. “It’s flowing, full (or) beyond capacity in some areas,” Hidalgo County Drainage District No. 1 General Manager Raul Sesin said of the system, which feeds into the International Boundary and Water Commission’s floodway. Municipalities send rainwater to the drainage district through storm drains, which in turn pushes the water through the floodway then ultimately into the Laguna Madre. Irrigation districts and cities also maintain their own ditches or canals, which also feed into the vast system. In response to the heavy rainfall that impacted the eastern part of Hidalgo County, the drainage district set up at least 10 pumps to extract standing water, which is poured into the floodway. However, no equipment will ever be as effective at clearing floodwater from roadways as gravity, Sesin said, a natural process that takes time, and requires a break from the rain. “It’s just too much water, and the system capacity is not designed for this amount of water, bottom line,” he said. In Weslaco, the fire department — with the assistance of county and statewide resources — conducted hundreds of water rescues as of Thursday afternoon and continued to do so throughout the evening and night. “All the cities, even if it’s the city of Houston, Los Angeles, if they got impacted with that much rain, that fast, they would be in the same situation,” said Weslaco Fire Chief Antonio Lopez who serves a dual role as the city’s emergency manager. His sentiment regarding the torrential downpour was echoed by Mercedes Mayor Henry Hinojosa, who said the infrastructure systems currently in place were working as expected. Despite reports Wednesday that floodgates were not open prior to rainfall, Sesin ensured this was not the case. Floodgates are only closed when the water level in the floodway reaches capacity, which did occur during this week’s severe downpour. Both Sesin and Lopez said pumps would remain in place at strategic locations, like Weslaco and Mercedes, throughout the week as necessary. “The system is still working; the pumps are still pumping,” Lopez said. Once water recedes, Mid-Valley cities will focus on recovery efforts as both Hinojosa and Weslaco Mayor David Suarez issued state of disaster declarations prior to Gov. Greg Abbott responding with one of his own Thursday afternoon. “We would want the citizens to know that our goal is life safety, and we’re already starting to think about recovery,” Lopez said.